Petsofoz.com Blog - Pet News, Information and Product Reviews: Best Flea Treatment for Dogs? What is the best flea treatment for dogs? this is one of the most common questions asked while working in a pet store. The answer is that there is no one best way to kill fleas, but there is a number of different ways. What we will do is list the common methods and talk about how effective they really are and rate how well they work out of 10. Are you ready to find out the best flea treatment for your dog? Flea Shampoo (4/10): This is the first method people will usually try. Using flea shampoo will take most of the fleas off your dog, but it will not do much to stop them from coming back which generally is the main problem. Of course some flea shampoos will be more effective than others but overall none of them are going to do a great job of stopping fleas from coming back onto your dog. On the plus side though it is a cheaper solution than most of the others methods of getting rid of fleas on dogs. If you are going to try a flea shampoo I would suggest Fidos flea shampoo or malaban wash as they seem to be the most effective. Advantage, Advocate and Advantix (8.5/10): These are all listed together as they all come from the same company and have the have the same ingredient that kills fleas (Imidacloprid) in them. Advocate for dogs also known as Advantage multi treats for fleas, heartworms, intestinal worms and ear mites. Advantix for dogs treats for fleas, ticks and insects. Advantage for dogs only treats for fleas, flea larvae and lice. These products are one of the most effective of getting rid of fleas and keeping them off. They last for a month at a time and start to work within a hour of use and are in full effective within 24 hours of application. Sure they still might not work as well for some people but 90-95% of people who use these products have success and continue to use them after. They might not be the cheapest solution but they do work really well. Overall the Bayer range has proved to consistently be one of the best over the years. Revolution (8.5/10): This is another very good solution to killing fleas on your dog. Revolution for dogs is very similar to Advocate as it treats for fleas, heartworm, intestinal worms and ear mites. It has showed time again that it works great and this is back up by the loyal following of repeat users. Overall if you are using Revolution know that you are using one of the best flea products on the market and is very hard to fault. Revolution for cats also is very popular and uses the same ingredient (Selamectin) to kill fleas as Revolution for Dogs. Frontline Plus (5.5/10): There was a time when Frontline for dogs was the best flea control out there, but that time has come and gone. Yes it still works well for a lot people but I would guess that about 75% of people who it use to work for, just doesn't work nearly as well anymore. No one really knows whether fleas have started to become immune to the formula they use or they have changed the formula in Frontline or what exactly has happened. But one thing we do know is that it isn't anywhere near as effective as it once was. If you are looking for another flea and tick product I would recommend using Nexgard, as it treats for fleas, tick and insects for about the same price and you will find it is much more effective on fleas. Frontline Spray (7.5/10): Unlike regular Frontline, Frontline Spray seems to work very well and a lot of people have a good amount of success with it. Maybe it works better because dogs get a larger dosage amount and are more thoroughly treated with it as it is sprayed all over the dogs body. The spray version of Frontline never really saw popularity like the tube version and I would guess this is because of the price. It works out to cost quite a deal more than other flea treatments. But overall we have very little complaints in its ability to kill fleas. Sentinel Spectrum (6/10): This product comes in a chewable tablet form and controls flea infestations, flea allergy dermatitis, heartworm, roundworm, whipworm, hookworm and tape worm. One big part that Sentinel for dogs does not treat for is Adult fleas. 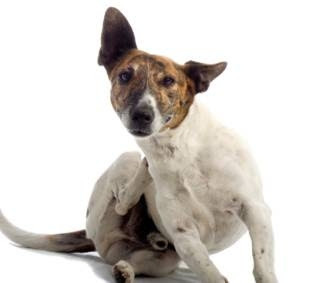 So if you already have fleas on your dog it will not get rid of those fleas, what it will do is break down flea infestations and control flea allergy dermatitis. If your dog already has fleas and you want to use Sentinel I would suggest using it in conjunction with Capstar or a topical solution like Advantage. But just because it does not treat for adult fleas it certainly does not make it useless in keeping fleas off your dog. Capstar (6/10): This is a small flea tablet that work only works for 24 hours at a time, but when given to your dog it kills 99% of adult fleas on them. Capstar for dogs and cats will not stop fleas from coming back on your dog after 24 hours but it does a really good job of getting fleas off. Some dog owners use capstar by giving there dog a tablet every few days and it seems to work well for them. In my opinion the best way to use Capstar is in-conjunction with Advantage, Advantix, Advocate, Revolution or Sentinel. Also if you do not have fleas at your house, but your dog has been to a friends house or the kennels and picked up fleas, one dose of Capstar should be able to fix the problem. Capstar tablets are a relatively cheap solution also. Comfortis and Panoramis (9/10): These are the newest flea products on the market and would also class them as the best on the market at the moment. These products are both made by the same company (Elanco) and use the same ingredient (Spinosad) to treats fleas. Comfortis for dogs treats for fleas, flea infestations and flea allergy dermatitis. Panoramis for dogs also known as Trifexis for dogs treats for fleas, heartworm, hookworm, roundworm and whipworm. They come in the form of a chewable tablet, that are easy for dogs to digest. In a very short time Comfortis has proved to be the leader in flea medications for dogs. Panoramis has only just been launched by we predict it will be just as powerful in killing fleas as Comfortis is. The only downside to Comfortis is that many dogs have had side effects, most commonly vomiting within in 1 hour of taking the tablet, after this happens it is recommended to dose the dog again. There have been many cases of side effects recorded, although they are still very rare, it is always a good idea to keep a close eye on your dog after dosing with Comfortis. In the way of killing fleas these products would still be my first recommendation. NexGard for Dogs (8/10): This is the first effective flea and tick chewable tablet. NexGard for dogs was released in 2014 and has immediately started flying off pet store and vet shelves. NexGard is made by Merial who are well known for producing Frontline, Frontline Plus and Heartgard. It rapodly kills fleas and controls the 3 main ticks. It can be used on puppies from 8 weeks of age. As it is a tablet, you can bath your dog after treatment without diluting the solution. NexGard price is on par with Advantix and Frontline Plus, which are the two other products that treat flea & ticks in the same medications. Bravecto for Dogs (9/10): Many people have heard rumors of a new tablet that treats fleas for 3 months. And the rumors are true and the product is Bravecto. It is a chewable tablet that will treat and prevent flea infestations are 3 months and control ticks up to 4 months (depending on the kind of tick). It can be used on dogs from 8 weeks of age and over 4lbs (2kgs). Although it is just 1 tablet, which is a easy way to treat your dog, you are not going to save any money as the cost is on par with other monthly treatments like NexGard. Simparica for Dogs (9/10): This is the latest flea & tick treatment for dogs. It comes in 3 packs and 6 packs of chewable tablets which are easy to give. They have 5 size ranges for dogs going up to 120lbs (60kg). We have found it to be as effective as Bravecto and more effective than NexGard & Advantix. Simparica for dogs is also at a cheaper price point than the other dog flea & tick tablets. Flea Collar (1.5/10): Most flea collars claim to keep fleas off your dog for 2+ months at a time, but in my experience I have not seen a flea collar keep fleas off for longer than 2 minutes. Of course not all flea collars are created equal and some might actually do something, most simply just wont do anything or enough to make any significant difference. Flea collars are cheap but I can not think of many other ways that are a bigger waste of money. Flea Powder (3/10): Flea powder is similar to flea shampoo and probably just as effective (which isn't very). Before the invention of flea medications, there was flea powder and this would of been the most effective method of killing fleas at the time (over 20 years ago), now days with all the great flea products on the market, this method almost seems useless in comparison. It wont hurt of use flea powder and it is cheap, so you can give it a shot, but if and when it isn't doing the job change to a real flea med instead of having your dog bugged by fleas all day. thank you for your report. I seems preaty good. I can say for my part that I will try some of this products. thanks for your help!!! Maybe you will want to place a twitter icon to your blog. I just bookmarked the article, but I had to do this by hand. Simply my advice. Hi, I've been a lurker around your blog for a few months. I love this article and your entire site! Looking forward to reading more! great article and by my own experience I generally agree with you. My only added comment would be do not use comfortis on any breeding females as it can cause abortions. I would say as it has the same ingredients the new panoramis would be an issue with regards to that too. On the Panoramis instructions it says "Seek veterinary advice regarding the use of Panoramis in pregnant and lactating females". I have not heard if it can cause abortions in breeding females, but that is something I will defiantly look into so we can inform people. Thank you for your comment. Can Comfortis be shipped to the USA?